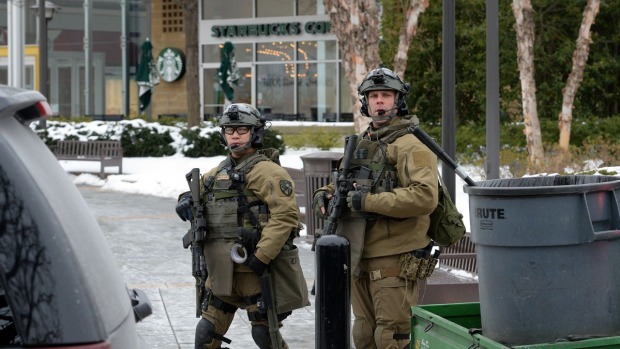 Accused Mall Gunman: "Someone You Wouldn't Expect"
About two-and-a-half hours after the fatal shooting Saturday morning at The Mall in Columbia, Md., the accused gunman’s mother reported him missing, though no connection to the shooting was known. Darion Aguilar, 19, was considered a quiet kid at Hubert Blake High School in Montgomery County, from which he graduated last year. He enjoyed swimming at a recreation center in Silver Spring and worked at a Dunkin Donuts on Route 1 in College Park, which is where his mother went to find him Saturday. The search for Aguilar escalated after his mother showed officers his journal. Police have not said what in that journal caught their attention. “The journal made him concerned about the missing person’s safety,” Parker said. Detectives tracked Aguilar’s cellphone signal to Columbia Mall. “It’s soon learned that our missing person and the gunman were one in the same,” Parker said. Aguilar is accused of shooting and killing two employees of the Zumiez store inside Columbia Mall before turning the gun on himself. Later that afternoon, Prince George’s County Fire and EMS searched Aguilar’s house for possible explosives before Howard County police searched the home for clues. “Our responsibility at that point was to go in and clear the house to make sure it was safe for others to enter,” said Mark Brady of Prince George’s County Fire and EMS. It wasn’t the fire department’s first visit to the house. They were called there in May 2013 for an attic fire. Aguilar was home at the time, and the fire was ruled an accidental electrical fire. “Nothing significant was noted about him or the family or the fire,” Brady said. Police have yet to find a motive for the shooting. Former classmates of the accused Mall in Columbia gunman described him as a quiet student they would never expect to do something like Saturday morning’s shooting. Aguilar reportedly was accepted into Montgomery College after graduation but did not attend, deciding to work instead.